If you meet a foreigner in China who speaks fluent Mandarin you can say they are hěn bàng 很棒. I got the new iphone 5S and I thought it was hěn bàng. Wayne Rooney’s goal against Uruguay was definitely hěn bàng. Although I didn’t think it was hěn bàng when Suarez hit the back of the net. most people would agree the great wall of China is hen bang. 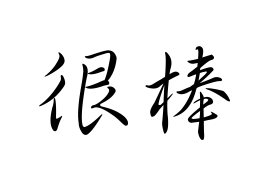 hěn 很 is actually an intensity modifier and is usually translated as “very”. However, this translation is often inaccurate. Firstly, the intensity of hěn is not as strong as “very”. In fact, as a rule of thumb, in Chinese all adjectives need to be combined with an intensity modifier. That is why Chinese people, when speaking English, use the word “very” so often. “This food is very delicious.” “That movie was very okay.” “I want my English to be very perfect.” That is literally how you would say it in Chinese, the word hěn appearing before any adjective. But before laughing at other peoples Chinglish (Chinese English) it’s important to make sure you don’t make the equivalent mistake when speaking Chinese, because in Chinese you don’t use the word shì (is/am/are) before an adjective. Bàng 棒 just means a stick or bat. I have no idea why “very bat” (hěn bàng) means “awesome” in Chinese, but one thing I do know is that if you use this word your speaking will sound hěn bàng. In some northern Chinese dialects, it means strong.